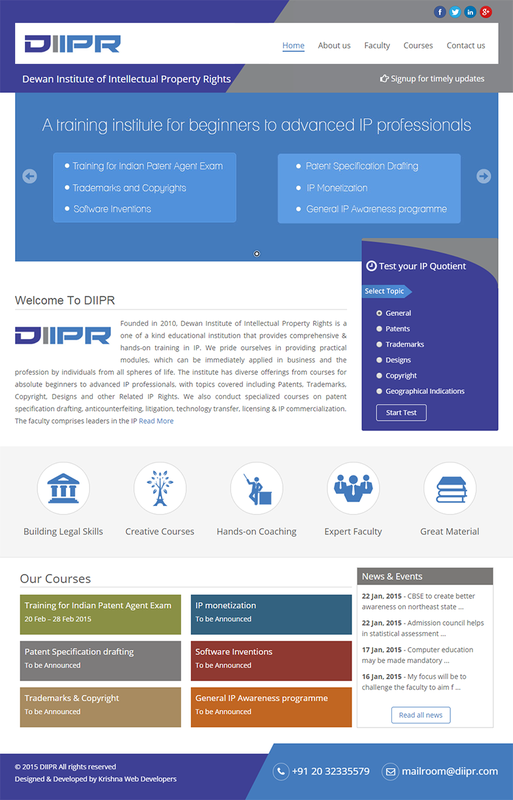 DIIPR.com is dynamic website for training institute. As a viewer you can recognize unique website design concept used for this website. For website visitors we have offer IP related test on the home page which redirects them to Test panel where they can choose the category and start test. After test ,they get their score along with correct answers. There is separate Admin Panel from which admin will create new tests and manage all questions for tests. They have control over latest news and events section which is displayed on the Home page.Other than news and events in the admin panel, they will get all notifications for all enquiries, they can directly get view of customer details and requests. We have developed and design very flexible website from customer point of view. DIIPR-Dewan Institute of Intellectual Property Rights. Institute of Intellectual Property Rights is a one of a kind educational institution that provides comprehensive & hands-on training in IP. The institute has diverse offerings from courses for absolute beginners to advanced IP professionals, with topics covered including Patents, Trademarks, Copyright, Designs and other Related IP Rights.